Two days ago a friend sent me this picture of a pair of point shoes with taps on them, asking me, “What do you make of this?” I didn’t know how to respond. Tap dancing en Pointe dates back to the days of Vaudeville and was considered a novelty act. Without any negative connotation, Toe Tap, as it was called, was classified in the same group as the stair dance, the chair dance, the cane dance, and tap dancing on roller skates. Each one of these kinds of routines added variety to the form of tap dancing. Whether what the new kind of routine added to the craft was considered novelty for novelty’s sake, or truly innovative was left to the opinions of the audiences, critics, and ultimately history. What all of these novel interpretations of tap dance had in common was the use technology to augment the craft of tap dance. 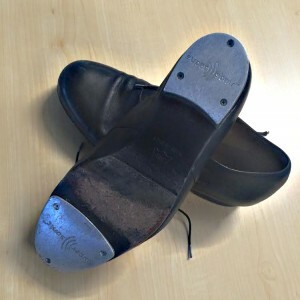 If we consider tap dance as one expression in the world of percussive dance, then the first pieces of technological innovation might be considered the leather oxford and the wooden board. Without these two, now taken for granted as our necessary instruments, tap dancers would still be pounding their bare feet on the dirt ground. Following the establishing of the basic tools, the next technological innovations were solutions to amplify our sound – the taps. Early tap dancers are said to have put bottle caps between their toes, while Bill “Bojangles” Robinson wore wooden soled shoes. The advent of the metal tap around the early 1900s eventually lead to a mass adoption, and is what the majority of tap dancers use today. The modern day tap shoe. Additionally, props were used to vary the context of the craft. Add a cane and you have additional surfaces to hit the floor and different sounds. Sit on a chair and you have changed the physical context changing accessibility to vocabulary. Props became the technology that dancers used to augment the craft. Today technology has permeated much of our culture. In the tap dance world dancers continue to experiment with the technology available to them in an effort to discover new expressions of an old form. The movie Tap, released in 1989, presented a vision for the future of tap dance in the final scene of the film. The vision was one in which technology would allow for the expansion of the sounds tap dancers could create. Through technology tap dancing could trigger any sound that could be synthesized or sampled. At the time, it was just a vision. As I child I saw that vision, and it has never left me. In 1996 I called Alfred Desio. I had found his name in the end credits of the movie TAP as the originator of Tap-Tronics™, the system he designed for electronic tap shoes. I expressed my interest in the technology and he generously shared his system with me. I even took a trip to visit him in Los Angeles where I got to see his complete setup in person. We even traded some steps. It was then that I began experimenting with electronic tap shoes. In 2001, I designed my senior thesis at the School of Visual Arts to include a live tap performance in which electronic tap shoes (this time developed with the help of Fishman Transducers) triggered sequenced music and live 3D animation in real time. Entitled Looking Within the piece pushed the limits of the accessible technology at the time. During the performance of Looking Within I had to adjust my dancing to accommodate the technology. This was a worthy challenge but ultimately felt inhibitive. Fundamentally, I could only express what the technology allowed me to express, and while my body and tap dance vocabulary could quickly adapt to new choices I wanted to make, the technology could not. I dreamed of a technology that would accommodate my dancing. I put my pursuit on hold, but the final scene in the movie Tap remained in the back of my mind. Today technology abounds in the tap dance world. We now have access to multiple shoe and floor designs that affect the sound quality (Check out this design developed by Anita Feldman and Daniel Schmidt in the 1980s) and numerous microphone techniques for amplifying tap dancing. Additionally tap dancers are exploring far beyond the codified wood floor, leather oxford, and metal tap modality. This past week two events in particular in the New York City area, one the campus of Bell Labs and one at the Joyce Theatre, showcased the possible future of tap dance and technology. On the campus of Bell Labs, I was the featured tap dancer in a show entitled The Shannon Effect. The show was part of the Claude Shannon Centenary and a dedicated celebration of Shannon’s contributions to technology (Shannon was such a pioneer Google even made a Google Doodle about him). Created and directed by Rob Harari, The Shannon Effect was part performance, part conference keynote, and part technology showcase, integrating technology into almost every aspect of the performance. For example, my movements triggered numerous audio and video effects in realtime amplifying the live experience without hindering my ability to improvise (video soon to come). At the Joyce this week, my friends in Dorrance Dance under the awesome artistic direction of Michelle Dorrance, and with Nicholas Van Young, premiered ETM: Double Down. Their new work marries virtuosic ensemble and solo tap dance with a new tap dance instrument. Designed by Nicholas Van Young, the instrument in comprised of a series of multiple small wooden platforms that act as electronic drum pads. Dance on one and one sound comes out. Dance on another and a different sound comes out. This allows the dancers to trigger a world of sound by dancing on the specific surfaces. The sonic variety is astounding, and while the dancing is adjusted to instrument, it remains a sight to be heard and song to be seen. You can read more about the show here, or go see it – final show is Sunday afternoon. So what about those ballet shoes with taps on them. I still don’t know. As an artist I may be labeled as an explorative purist. I enjoy pushing boundaries, but enjoy just as much discovering the boundaries themselves. When it comes to the integration of technology with a craft that has an established tradition, it is my belief that the technology should amplify the fundamental core of the craft. If the tradition of the craft is less of a consideration than the purpose of the craft – i.e. the heightened expression of a particular narrative or emotion – then things change. When the technology serves the artistic expression it can fundamentally change the craft. That change might be heralded as innovation or derided as heresy. The audiences, critics, and ultimately the context of history will tell. In the meantime, I am eager to see what happens.